Your RVing guide to driving, towing and parking in the Big Apple. While most RV trips focus on the outdoors, you may want some bright lights and city fun every now and then. When you think big city, there should be one that pops right into your head: The Big Apple. New York City is infamous for its traffic and bustling streets, so what place does an RV have on its streets? But is it possible to RV in and around the city? We’re here to offer advice on driving and parking your RV in New York City. NYC is bustling with people and vehicles at every hour of the day. While driving an RV through those streets may be challenging, it's not impossible. City buses, freight trucks, and other larger vehicles drive them every day, so there’s no reason you can’t either. The main difference is that they do it every day and you don't. Pro Tip: don’t try to navigate NYC streets if you’re a rookie RVer. Experience and knowing your rig from head to toe is necessary. If you rent an RV, steer clear of New York City, too. The standard of driving in NYC is to be aware. Be aware of what’s going on ahead of you and to the sides. Use any passengers as the second pair of eyes and ears to help watch your surroundings. Take your time, don’t speed, be ready to hit the brakes and do your best to stay focused at every hour of the day. If you think New York drivers are bad, the pedestrians are even worse. They’ll cut in front of you, walk around your RV, and most of the time you won’t see them until it’s too late. That’s why being aware is the number one driving skill to have whether you’re traveling by car or RV. Some things to keep in mind when RVing through the city is that if you’re carrying more than ten pounds of propane, you will not be able to go through any tunnels without prior clearance from the Department of Transportation. Your RV is carrying hazardous waste if you’re traveling with propane. So, you’re held to the same standards commercial trucks and vehicles are when traveling through the city. If you are going over any bridges with propane, you are required to travel on the upper level every time. You can travel on any New York State Expressways in any type of RV. While the above resource is related to trucks and commercial vehicles, your RV will more often than not fall under the commercial vehicle classification in NYC. Parking your RV in NYC is more of a hassle than driving it there. We don’t recommend attempting to park your RV on New York City streets especially for an extended stay, chances are the people around you won't have the patience to wait for you to park. Honestly, there aren't many places in NYC you'll have the room to park your rig anyway. Pro Tip: Even if you find a place to park your RV in NYC, we don’t recommend attempting to park. The time it’ll take you to get into place will cause commotion from other drivers and pedestrians which will put you on edge. New York City law doesn’t allow RVs to park in city spaces for more than 24 hours. While this law seems relaxed, we don’t recommend it. Area residents don’t appreciate it and you leave yourself at risk for crime. You don't want to get towed in NYC, it's expensive, complicated, and downright frustrating to deal with in a city that large. 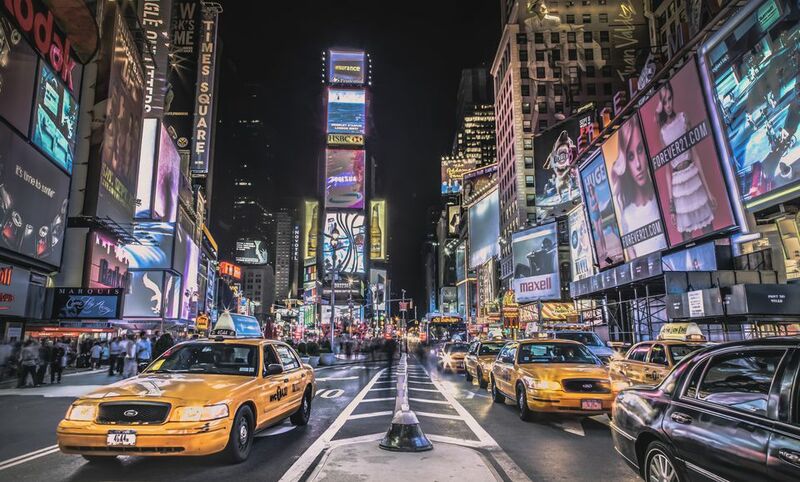 Again, since your RV meets the requirements that make it a commercial vehicle to the city of New York, these guides are key to understanding the regulations that guide such vehicles when traveling around the city. Choose an RV park located right outside the heart of the city. That way you stay out of all the messy traffic, are in a more secure environment, don’t have to dry camp, and are still only a few minutes from most sightseeing destinations. If you’re looking for a unique combination of being able to choose between city life and a relaxing outdoor atmosphere, you should look at Cheesequake State Park. This state park is in Matawan, New Jersey. Cheesequake offers wooded sites along with some great fishing in a unique marshy ecosystem. You are also less than an hour by bus or train into the five boroughs of New York. Cheesequake offers no hookups so be prepared for dry camping. Croton Point Park is another good choice for RVers looking to venture in and around the city. You’re not far from New York City and can explore the local area, which includes fishing, hiking, and biking. With full-service hookups, both weekly and monthly site rates available, and giving you access to boat ramps, bathrooms, and a playground, Croton Point Park is a great base camp for venturing into the big city. Pro Tip: Read this guide on five of the best RV parks in New York for an idea of where to stay outside NYC itself. As you can see, taking an RV to NYC is not as difficult as you might think. Try RVing to the Big Apple for some big city fun when you’re ready to take on bigger RV challenges and more interesting destinations.